As I posted yesterday I want to show you what I received in the mail from 2 trades I recently did. one of my Geisha cards for a Gingersnap Geisha challenge and asked if I was interested in trading it? 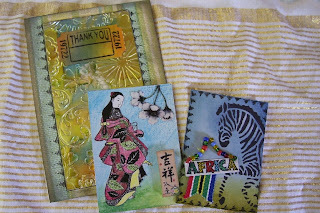 a pic of the cards I sent to Bella but she will probably post them on her blog. Here are the cards that Bella sent to me including this wonderful greeting card done with foil card stock, alcohol inks and embossing. It is so lovely. Bella and I decided after the Rotating Postal strikes are over we may plan to do another swap. I haven't swapped ATC's in a while so it is nice to get back to it. I always feel refreshed after not doing something like that on a smaller canvas. Thanks again for a great trade Bella. Next up is my matchbox from JoAnne's FlickR group Vintage Dragon Fly. I received this lovely matchbox with all kinds of goodies inside and out. Melissa spoiled me and she also wrapped everything in this beautiful tea towel that has shells and gold threads in it. collection of shells and beads. 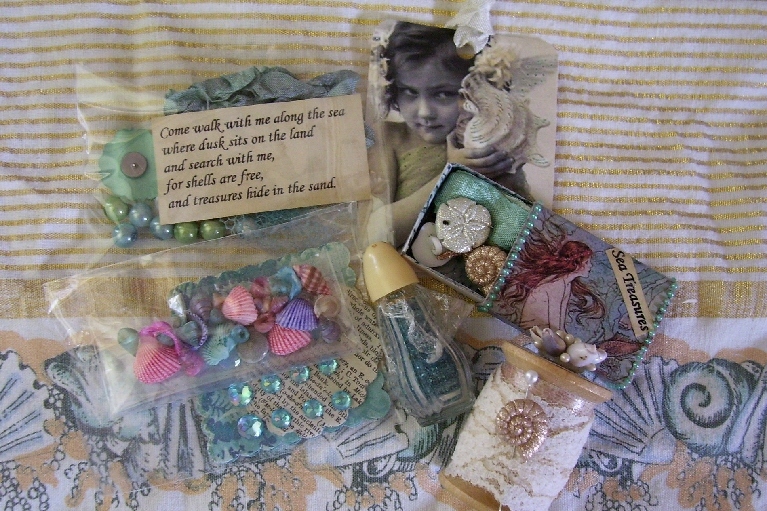 The matchbox itself has a lovely mermaid on it and also more goodies inside. I was blown away. Thank you Melissa. After a week like I had last week and worried about my car this was such a nice treat to get mail that was fun and full of arty goodness. You certainly meet some wonderful artisans online who are generous and in most cases like minded. Today was very hot and humid and we just got over a thunderstorm with hail and winds and lots of lightening. We surely needed some cooler weather after the day we had today. I was up early and got the vacuuming and floors washed so needless to say I was sweating buckets by the time that was over. My exercise complete along with a cleaner house. Well that's it for today folks. Thanks for dropping by, I always read your comments and I do try to visit each of you even if I don't leave a comment. Blogger has been a tad bit ornery lately. I have bought the soccer trading card album to keep all my ATCs in as they are the same size as the kids soccer cards! I just took out the soccer covers and will make my own to go in the sleeve. 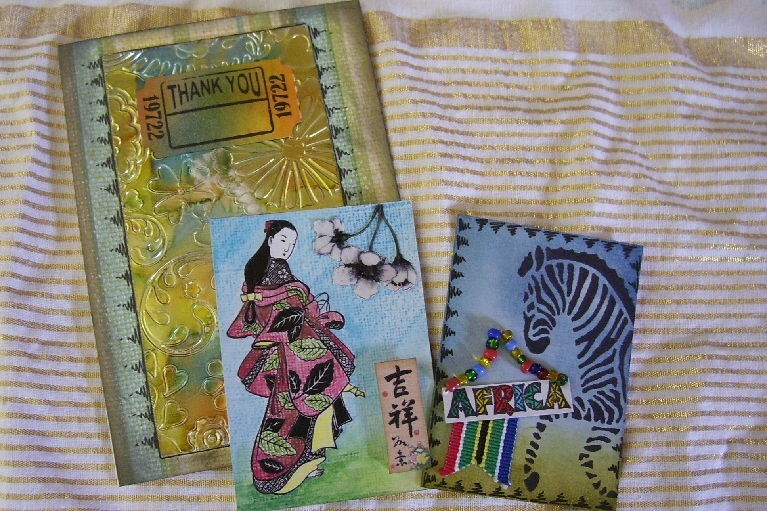 Those are lovely ATC's from Bella.. too cool to have gotten some from Africa... I miss making and trading... love the matchbox too.. so pretty and such loverly goodies... ahhh cleaning... should get to that today...lol too cool to sweat buckets here though.. but do have the next few days off... whooo hooo!!! Your box from Melissa is beautiful! She was my first ever blog friend/swap partner in a tussie mussie swap and I know how she spoils a swap partner!